Pictured above at the check donation ceremony are (from left to right) Joe Altavilla, District Sales Manager, Subaru of New England; Devin Carney, Connecticut State Representative (R-23rd); Kathryn Wayland, Reynolds’ Subaru; Hayden Reynolds, Reynolds’ Subaru; Laura Martino, Middlesex Hospital; Melissa Ziobron, Connecticut State Representative (R-34th); and Justin Drew, Middlesex Hospital Cancer Center. Reynolds’ Subaru in Lyme has donated $30,000 to Middlesex Hospital Cancer Center’s new Westbrook location. The generous donation will ensure that cancer patients have access to the best possible treatments and care team. 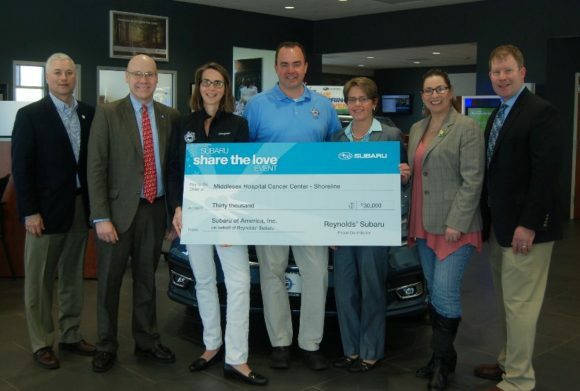 Reynolds’ donation was made following the conclusion of Subaru of America Inc.’s Share the Love campaign. Reynolds’ Subaru and the Reynolds’ family, however, have been supportive of Middlesex Hospital for many years.